Celebrate the south, trailer parks and Wal-Mart parking lots. Don't worry about being trashy; grow out that mullet and start stocking up on Bush light Beer because it time to throw a White Trash party! It’s time to transform your nice digs into a trailer trash park! One of the best parts for setting up for this party is that decorations are very cheap. When picking decorations remember that the tackier the better! 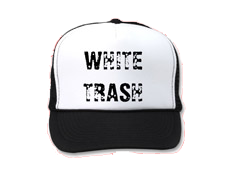 To start finding white trash decorations all you need to do is go to junk stores, thrift stores and flea markets. For seating set up lawn chairs and an old couch. As decoration hang socks, t-shirts, bras and underwear on a cloth lines. Also, put up posters of swimsuit models and race cars. Nothing says white trash better then cheap food on paper plates with cheap beer. For food have Cheese Whiz with crackers, Spam, chips and dip, pork rinds and mini wieners. These are all cheap to buy and are stereotypical white trash foods. As far as drink you can never go wrong with cheap beer and punch. Some of the best cheap beers for this party are Milwaukee's Best, Keystone Light, Bush Light and Natty Light. To complete this party you really need to make sure you have the right kind of music. Make a playlist that features lots of country music and southern rock. Some artists to think about adding are Kid Rock, Springsteen, Van Halen, Black Sabbath, ZZ Top, Lynyrd Skynyrd and John Cougar Mellencamp. It should be real easy for most guys to dress up for a white trash party. Guys just need a wife beater t-shirt, blue jeans, work boots and an old greasy baseball cap. If you want to stand out in the crowd get a mullet wig and a mechanic's shirt with your name stitched on it!